There are eight large snap fasteners in the wrap skirt pattern (Burda 7147) I’m using for the pink tweed so I called some fabric shops to source them. To my dismay, the biggest I could find was 1.5cm in diameter (in TWI Fabrics). That’s bigger than the standard little fasteners I have, but no match for the job of holding a skirt together. The guy in TWI directed me to a camping shop (canvas snap fasteners are used in caravan awnings), where I learnt that canvas snap fasteners are also used in boat covers. So I googled marine suppliers and contacted one in Cork. They directed me to a marine textile supplier. 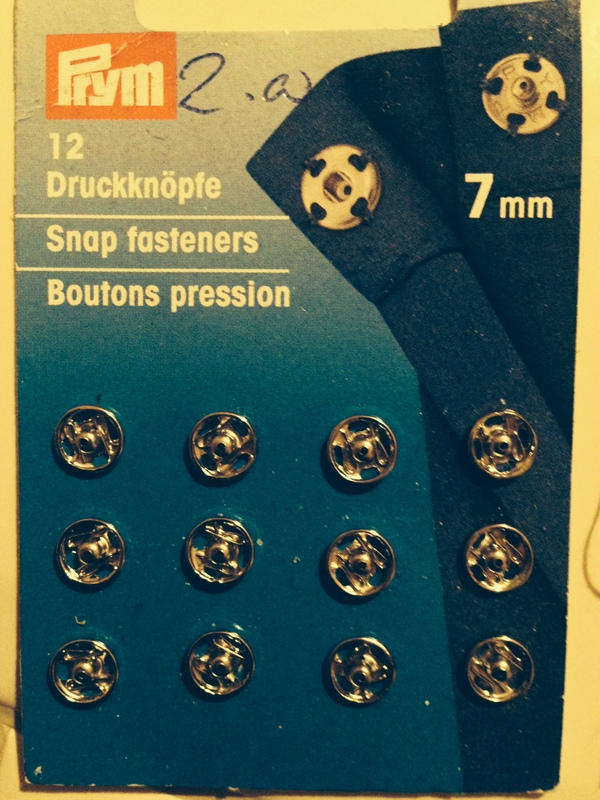 Yes, he said, they had large snap fasteners. Yes, a good size (half inch diameter). 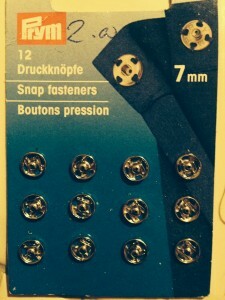 Unfortunately, these fasteners are designed to withstand gale force winds and require significant force to be opened, making them pretty much unusable for any type of fashion garment. So disappointing. However, the conversation was ultimately productive. We discussed what might work for the tweed skirt, agreeing that the canvas fasteners were out. He said he worked in a school supplier factory for a while and suggested a hook and bar. 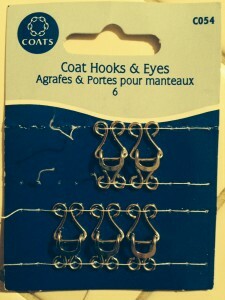 It’s similar to a hook and eye but bigger and more solid. An alternative suggestion was to get an old pair of shoes (or find some in Penneys) and cut off the buckles or straps. He advised that I pierce holes in the leather with a bradawl and then handstitch it to the fabric. A v cool idea. I like the mixing of shoes and fabric. As there’s already some lace involved in the pink skirt, I think low-key closures would work best. Definitely an idea for another skirt though. What next? 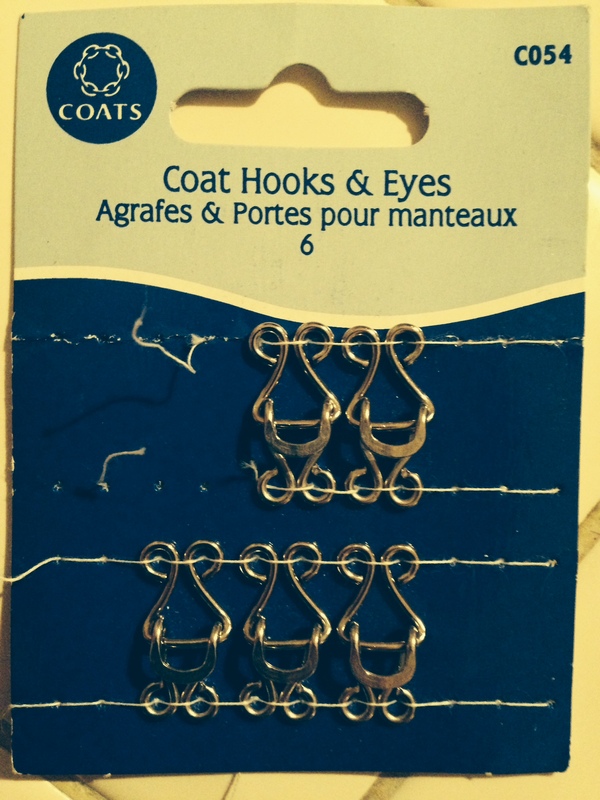 Nancy saved the day for me, as ever, finding a strip of coat hooks and eyes in her haberdashery boxes. They look good. I think they’ll work. Only five but, hey, life’s not perfect.